Currently based in the San Francisco Bay, Chris Ryan is a digital marketing professional. With specialties in social media management, film production, SEO, and digital branding, Chris makes his coins at Chegg, spearheading multimedia content production and strategy. At Chegg, Chris is able to combine his passions of higher education and making killer content into one. Chris has produced content for Vertafore, Michigan State University, Shawn Mendes, Wharton Center for Performing Arts, and several more. With an analytical focus and a creative eye, Chris is always looking for new opportunities to expand his skillset, while learning a new software along the way. Want to get all the professional tea? Download Chris' resumé here. Chris Ryan, currently based in San Jose, California, has been doing standup comedy professionally for the last five years. Since winning the 'Last Spartan Standing' competition during his first performance in East Lansing, Michigan, Chris hit the ground running in the midwest comedy scene before expanding nationally. From opening for touring celebrities, to headlining a college tour, Chris brings his quick wit and experience to stages across the country. 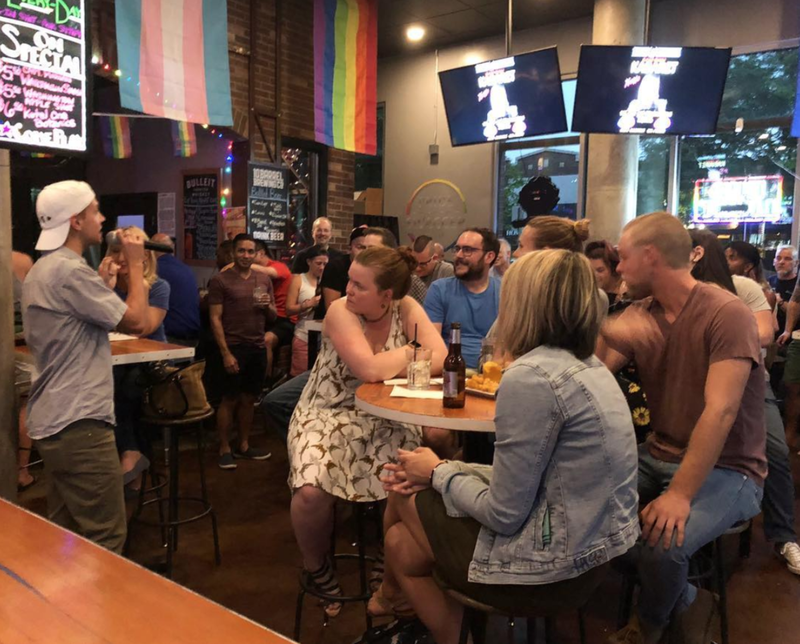 A picture of Chris Ryan hosting his bi-weekly mic at Pride & Swagger in Denver. Standup comedy has brought me to amazing cities and to meet even better people. Some of my experience includes being the two-time winner of the prestigious midwest comedy competition 'Last Spartan Standing,' touring colleges in the midwest, and headlining several Pride festivals. I've also produced, hosted, and headlined several shows, including the bi-weekly 'Pride & Swaggar Mic' and the monthly 'Girls & Gays Comedy Showcase,' both in Denver, CO.
A picture of Chris Ryan with some of his writers for the sketch comedy show, SideShow. While I love being on stage, my favorite part of comedy is actually behind the scenes. Comedy I have written and/or produced has been featured in TV, film, radio, and web. Some of my favorite credits include producing the film, 'Gay From Gaylord,' writing content for companies like Chegg, and being the Head Writer for the successful sketch comedy show SideShow for two years. Now it's time to get personal. Hey there - I'm Chris, so pleasant to e-meet you. I'm originally from a veryyyy small farm town in Northern Michigan, but I'm loving it out here in the Bay. When I'm not crafting a story on the web or making 'jokes' on stage, you can find me kicking it in the mountains, obsessing over musical theatre, or playing some kind of sport. Follow me on social media, @ChrisRyanOnline, or don't hesitate to reach out! It can be lonely behind a computer screen at work, so I'm always down to make a new friend or nine.